Thyroid Support is a synergistic blend of nutrients, herbs and trace mineral-rich foods that support thyroid health and function. The blend of whole herb extracts includes ashwagandha to support thyroid function. Sensoril - the ashwagandha extract we use in this blend - revitalizes metabolic processes associated with stress and fatigue. Additional whole herb extracts include guggul to rejuvenate thyroid tissue, holy basil to enhance metabolic function, and forskohlii root, which contains forskolin, an activator of cAMP (cyclic adenosine monophosphate). This professional grade thyroid formulation also includes organic bladderwrack, organic Irish moss, organic kelp, organic dulse, and organic porphyra umbilicalis (seaweed) to provide naturally occurring minerals (including iodine) that support thyroid function. A comprehensive, non-glandular solution, Thyroid Support effectively supports healthy thyroid function with 100% whole food nutrients. The recommended daily dose is 2 capsules, taken in the evening before bed. As with all professional grade supplements, it's best to consult with your personal physician before taking this formula. 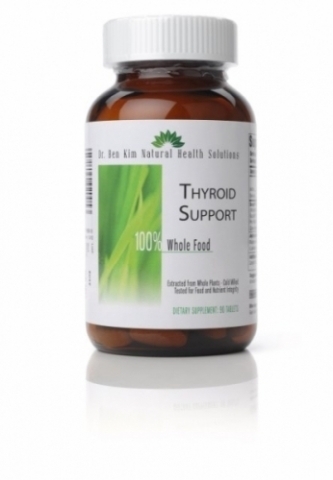 Thyroid Support is designed to nourish and support thyroid tissue. My experience has been that it's generally helpful to people with hypothyroidism. Regarding iodine, when it comes from a real food source, I have found that it is supportive of thyroid health, even in some cases of hyperthyroidism, including Graves' Disease. My experience has been that it's fine to take Thyroid Support along with prescription or natural thyroid medication, including synthroid and armour thyroid, though it's prudent in such cases to do a follow-up test to assess thyroid output and TSH within three to six months. But these matters should be discussed with your personal physician prior to commencing Thyroid Support. Please note that ashwagandha (an ingredient in this formula) should not be taken while pregnant, nursing, or if you are on medication for hypertension unless you have been given consent by your personal physician. I have dealt with hypothyroidism for years and had a particularly bad "spell" a couple years ago that warranted an increase in my Synthroid dosage as well as the addition of growth hormone injections. Both of the meds had terrible side effects and I can't say I didn't feel worse because of the meds. I'd had enough and was desperately looking for another way. 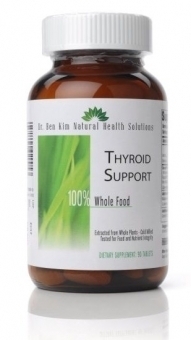 Having been a long-time follower and fan of Dr. Kim's I decided to try his Thyroid Support Formula. I started out using this formula about six months ago and am happy to report it has worked unbelievably well. I'm off both prescription medications and feel like a new person. Thank you, Dr. Kim.